Brantford – Can public art be a catalyst for healing and community discourse in the selfie generation? How does public art stimulate the process of reconciliation? How do we translate symbols and ideology across cultures? These questions and more will be explored when Wilfrid Laurier University’s Faculty of Liberal Arts hosts a panel presentation and discussion Sept. 21 at the university’s Brantford campus to consider truth and reconciliation through culture and the arts. The topic is inspired by the Brantford Public Library’s new mural La Landscape de Kanata and the journey of creating works of public art that provide a visual story of the evolution of the community. 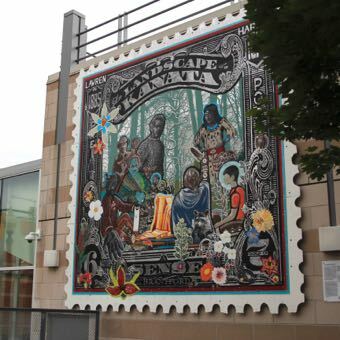 La Landscape de Kanata is a metal quilt, created by a group of artists led by Dave Hind and dedicated to the Brantford-born Group of Seven painter Lawren Harris. In the piece, Harris is surrounded by a symbolic group of seven, with each figure chosen based on Brantford history as well as cultural and landscape connections. Each figure was created by a different artist, brought together in the spirit of creating community art. Artists involved in the project include Hind, the Aluminum Quilting Society comprised of Jason Dong, Thomas Anderson, Bonnie Whitlow, Ralph Heather, Shana Elijah, Daniel Hill, Arlene Laskey, Steph Jacobs, Andrea Flockhart, Judy Devine and other community participants. The panellists include Glenhyrst Art Gallery of Brant gallery director Ana Olson, artist Dave Hind, Laurier Indigenous student support coordinator Bonnie Whitlow and the City of Brantford manager of tourism and marketing Sara Munroe. The panel is moderated by Art Gallery of Hamilton CEO Shelley Falconer. Hind has been working with recycled aluminum for nearly 20 years, connecting with the idea of reusing discarded materials. “I love that it had a past life, so there’s a layer of symbolism or meaning in the work, that it has a cycle of life,” he said. The artwork was selected through a call for artists by the Glenhyrst Art Gallery to honour Lawren Harris. Hind wanted the community art piece to incorporate the area’s relationship with Indigenous peoples and Harris’s relationship with the landscape. “Harris’s story is an amazing story, but it's not the only story,” said Hind. The lecture is hosted through the Faculty of Liberal Arts Dean’s Community and Alumni Advisory Council as a way to connect the university with the wider community. The free event is open to the public and will be held at Market Square Mall basement, 1 Market Street Brantford. Doors open at 6:30 p.m. and the panel discussion takes place from 7 to 8:30 p.m. Please RSVP to FLAadmin@wlu.ca.